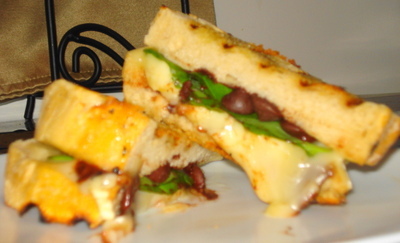 Brie, Basil, and Dark Chocolate Panini - Spork or Foon? This is courtesy of Giada Di Laurentis. She always experiments with unusual flavor combinations, and this one really hits the mark and is very simple. I am not going to put any measurements, because I think that this should be made to one's liking. 4 slices rustic bread, sliced 1/4 inch- 1/2 inch thick. Heat olive oil on grill (or pan, if you are using a pan). Top 1 slice of bread with cheese, basil, chocolate, and salt, to taste. Top with another slice of bread and drizzle olive oil sparingly over bread. Place on grill and press down until cheese has started to melt and bread is golden brown, about 2 minutes. Flip and cook for additional two or three minutes, until bread is golden brown. Slice and serve immediately. It's a very interesting article, be worth of reading.